This was a really windy morning, 24 -28 mph Westerly with gusts of up to 50 mph which restricted the starters to only 10 boats. Peter S set a long beat down to 4 and then across to 9, down to 3 then back to 1, up to 5 on the buoy line, along to 6 and finally 7. Dave L decided to team up with Hugh in his Leader and others decided to watch from the bank ! At the end of the first lap Steve P led Hadey, both in 4.7s, with Newton & Ellen (Laser 2000) in 3rd with high wind ace Jon 4th, Curtis 5th, Adrian 6th and James P 7th all in Lasers. Hugh & Dave L had come to grief in the Leader and impaled the mast, unfortunately bending it in the process. William managed the first two marks before capsizing his Topper and retiring and Ken P also decided to call it a day before the end of the lap. On the second lap Newton & Ellen also embedded their mast in the mud and that was the end of their race. When Ellen was exhausted and sitting on the centreboard for the third time she looked down the lake and every single boat was capsized ! James even managed to get from 4 to 9 with his Laser upside down and that was the end of his race ! Steve P was still in the lead but Jon had come through to 2nd with Hadey 3rd and Curtis and Adrian 4th and 5th. Well done to all the brave souls who ventured out, especially young William and Hadey and a big thank you to the OOD team who did a good job in difficult and arduous conditions. This was actually more of a duathlon with sailing and swimming in place of the usual cycling and running! Perhaps we should put this forward as an event for Rio in 2016. Why not come down to the club on Sunday afternoon and unpack your boat from its winter hibernation. David, Paul and other members will be on hand to offer help and advise on rigging and sailing. For anyone wishing to brave the forecast strong winds safety cover will be available. The RS Aero class are heading for Reading SC this Saturday with a 10mph breeze currently forecast this is likely to be a good day’s sailing. If you are around then why not pop down and watch or lend a hand with launching and recovery. For those interested in the RS Aero we should have a demo boat available, but please register your interest with Paul Robson. Well it was more like Spring this morning, a beautiful sunny day with a 9 mph ENE wind. The race team of Keith, Katherine, Alistair and Peter set out in the safety boats for Tektona and established base camp. The first beat was down to 6 followed by a run back to 5, a reach down to 9 and then a run up to 4 and on to 3, round 3 and close hauled to 2 and back through the start line. There were 21 starters and it was good to see Monica back with us and also the appearance of Frantz in his Contender and Dean & Nick in the Laser 2 and Mark & Ellen in a RS 200. Before getting on the water Steve S and Mike C decided to swap boats for the day. Steve has a Solo of his own so would be in his element, but it was Mike C’s first outing in a Laser. There was the usual staggered start with William P (Topper) first away and Steve P (505) last away with everyone else at their allotted times in between. At the end of the first lap William was still leading with Peter S (Byte) 2nd, Monica (Europe) 3rd and Steve S (in Mike C’s Solo) coming up fast in 4th place. Hadey (4.7) was in 5th place with Mike A (Lightning) 6th, Newton & Roz in their Laser 2000 (nice to see you back Roz) 7th and then Nev & Sally (Leader) in 8th. The first Laser through was Richard S who had just caught Peter R in his Enterprise, then there were the five Lasers of Ken, Jon, Mike T, Mark B and James P being closed down by Ian C (Supernova) who had just passed Mike C (who was trying to get to grips with Steve S’s Laser).Then came the late starters of Dean & Nick, Mark & Ellen, Steve P and Frantz. Peter S was leading at the end of the second lap and had managed to round all the marks of the course ! Steve S had moved up to 2nd but William was still hanging on to 3rd place with Newton & Roz moving up to 4th pushing Monica down to 5th. Nev & Sally had moved up one place to 7th, Mark B was up four places to 10th and Ian C was up five places to 11th. Frantz in his Contender had decided to call it a day. On the third lap Jon clipped No 5, did his turns and got to 9 without losing a place! Mike A tried to squeeze between Mark B and No 2, but brushed the buoy, did his turns but he lost two places ! On the same lap the boats in the middle of the fleet rounded 9 and the wind completely disappeared and then came up in completely the opposite direction before veering round again to the original direction ! By the end of the third lap Steve S had taken the lead with Peter S 2nd and Newton & Roz 3rd. Ian had now moved through from 11th to 4th with Monica still 5th. Richard S was the leading Laser in 6th followed by the Lasers of Jon, Mark and Ken. Peter R had moved up two places to 11th and Mike T and James P were up three places to 12th and 13th. Steve P had moved up two places to 18th. Monica decided three laps were enough and joined Frantz on the bank. At the finish gun Steve S was still in 1st place but Ian had moved up one more place to 2nd with Newton & Roz just pipping Richard for 3rd by about half a boat length. Peter S was 5th and Jon C 6th. Ken and Mark had scrapped all race and Ken just managed to lead Mark at the gun to finish in 7th. Steve P had moved up two more places but could not quite catch Hadey ahead of him. William managed to stay ahead of Dean & Nick and Mark & Ellen. Final Positions were 1st Steve S (Solo); 2nd Ian C (Supernova), 3rd Newton & Roz (Laser 2000), which must be the first time this year a Laser has not been in the first three ! 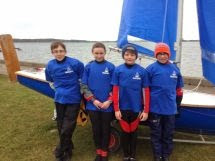 A short report on the National Schools Sailing Assoc team racing event at Oxford Sailing Club that RSC took part in this Saturday 21st March. 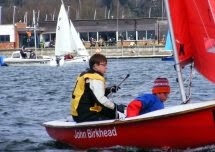 The Event: NSSA Match Racing Championships, with 20 teams from as far afield as Lancashire and Worchester. The RSC Team: Team 1 Hadey (helm), Louis (crew), Team 2 William (helm), Joe (crew). The Happenings: A grey blustery day greeted the team at Oxford, the first challenge being how to rig their Fireflies. Ably assisted by the Commodore and Boat Park Marshall who ensured that all the ropes that looked as if they needed to be attached were attached to something that looked at least meaningful if not necessary. The adult helpers then eying the wind and the weight of the crew decided that loads of kicker and outhaul was the order of the day. Then they were off ! with the briefest instruction on how use the complicated pulley system to lower the steel centre-boards. The first race against West Oxford A was won, on account of one of the other boats capsizing and then turtling – which gives you some idea of the wind conditions! The second race was more confused with William and Joe drifting off to one of the less frequented parts of the reservoir as they attempted to re-rig their jib sheets. Meanwhile Hadley and Louis in a surfeit on enthusiasm, ended up starting in the race before theirs ! At this point common sense broke out in the race committee and there was a hiatus while all the boats were re-rigged with storm mains. This pause was enlivened with the launching of an International Moth, who then proceeded to demonstrate some truly spectacular capsizes. Not sure I can remember much about the third race against Worchester, other than I am happy to report that Oxford Sailing Club does a smashing line in bacon sandwiches! Fourth race against OTRA, saw OTRA ‘s two boats in the lead after the windward mark. But with some good downwind sailing and gaining starboard rights on the final approaches to the finish line saw Hadley & Louis squeaking into first. William and Joe were very close behind and could have squeaked 3rd place if they had called their rights as well – but politeness got the better of them ! 1 win and 3 losses didn’t see them through to the quarter finals. Anyhow it is not the result, that counts, both Alastair and I were very impressed with the way that both crews handled in what were to them very unfamiliar and large boats in very trying conditions. Unlike other teams, no one capsized (we aren’t counting Hadey falling out her boat before the start of the first race !). 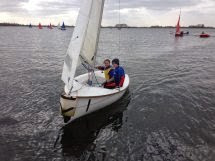 Also worth bearing in mind that for Joe and Louis this was the first sailing for them this season – a baptism of fire ! So well done to everyone, and a particular well done to Hadey for organizing the entry and the teams. The second race of the Spring Series, but not much like Spring weather as there was a brisk 10 mph North Easterly with a cold edge. Chris A used a Tektona start with a beat to X (set in the middle of the lake NW of 8) then across to 8 a run up to 5, a nice reach to 2 and then another run to 3 and back through the start. There were 17 starters and first away again at 3 minutes was William P (Topper) followed at 12.5 minutes by Peter S in his Byte and Mike A (Lightning) at 14.5. At 15.5 minutes the Leaders of Neville & Sally and Hugh & Hadey sallied forth with Sylvia (Radial) and Mike C (Solo) going 30 secs later and Newton & Ellen (Laser 2000) another 30 secs after them. At 19 minutes the eight strong Laser pack set out with Ian C (Supernova) going at 20.5 minutes. At the end of the first lap Peter S came through in the lead with William P 2nd, Mike A 3rd and Newton & Ellen 4th. Peter S was still in the lead at the end of the second lap but then realised he had not been going down the lake as far as No 3 ! It was a long way back to re-round so he decided to retire. William was still 2nd but Newton & Ellen had come through to take 3rd. By the third lap David C (Laser) had taken the lead with Newton & Ellen 2nd and Curtis in another Laser (What – no Otter !) was up to 3rd with Mike A hanging on to 4th but being closed down by the rest of the Lasers. In the meantime Hugh & Hadey had capsized twice and had a boat full of water so decided that was enough water for one day ! The fourth lap leaders were the same, but Richard S (Laser) had moved up to 3rd pushing Curtis down to 4th with Ken P (Laser) 5th and James P (Laser) 6th. Ian had caught some of the Lasers and was 7th followed by Sylvia in 8th. After five laps the first five boats had maintained their positions but Ian C had moved up one more place to 6th. Jon C (Laser) had gained two places and Steve P and Alistair S both in Lasers had gained one place. The final gun went before the end of the sixth lap with most boats maintaining their position, but Ian C made up one more place to 5th and Steve P also gained another place. The final positions were 1st David C; 2nd Newton & Ellen; 3rd Richard S; 4th Curtis. It was definitely a Laser day with only two other boats in the top ten. Hugh and Hadey had a terrible day, not only did they capsize twice but Hugh put his elbow through the aft buoyancy tank inspection cover and then one of the stub axles on their trolley broke ! Simon B set a beat up to 3 then back along the buoy line to 4, towards the island and round 9, across to 2 then back towards the island and around 1 finishing the course round 6 and 7. There were 23 starters but being a pursuit race they did not all go off together and first away were William P and William D in their Toppers followed four minutes later by Curtis in his Otter (yes an Otter on the lake ! ), two minutes later John C went off in his Topaz and then three and a half minutes after that by Hadey (4.7). Mike & Sally (Leader) were next away followed one and a half minutes later by Mike C (Solo) and the two Radials of John W and Steve S. Then it was the turn of Newton & Ellen (Laser 2000) to set off with Peter R (Enterprise) following one minute later and the pack of 11 Lasers starting one and a half minutes after Peter and finally Ian C another one and half minutes after the Laser pack. James P got pushed the wrong side of the start mark by David C (legally) (note for those that don’t know, you can’t claim water at the start mark). James then turned hit someone else and ended up doing a 720. Not the best of starts and his head must have been spinning by the time he got going. (Not to worry – he’s quite used to that !). Mike and Sally somehow managed to capsize gybing at 4, some technical problem with the sheets ! always a good idea to blame the equipment, it never answers back. At the end of the first lap William P was still in the lead with Curtis 2nd and John C 3rd but Steve S in his Radial was closing in and had just passed Hadey to take 4th place from her. By the end of the second lap Curtis had taken the lead, William P was still in 2nd but David C in the first of the Lasers had moved up to 3rd pushing Steve S to 4th with Jon coming up to 5th. At the end of the third lap and approaching the full time whistle David C was 1st, Jon C 2nd and Newton & Ellen had moved up to 3rd and Ian C to 4th. The Lasers had come through and occupied the middle of the fleet and were having a terrific battle. At the hooter the final positions were 1st David C; 2nd Jon C; 3rd Newton & Ellen; 4th Ian C; 5th Steve S and 6th Richard S.
Please check your e-mails for details on how to renew your membership. Discounts apply for those who renew before 1st April 2015.